In addition to annual picnics, Salem Baptist hosted fashion shows, ice cream socials, “hay rack” rides, and basket dinners. The latter event was held as a sort of courtship ritual, in which young men purchased baskets of food prepared by young ladies they wished to pursue romantically. Traditionally, the women (in any church) play a key role in raising funds to keep operations moving smoothly. This was certainly the case at Salem Baptist. Over nearly two centuries they organized bake sales, carnivals, suppers, dinners, teas, and balls in their effort to financially support the church. The congregation organized a Ladies Aid Society for its women members. They, in turn, sponsored a college scholarship program and a Progressive Club for the youth of the church. 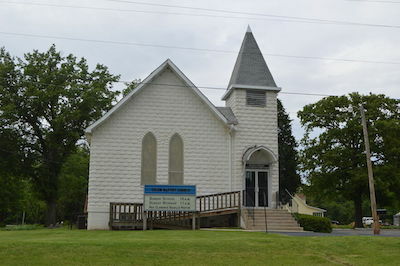 By the 1960s the church membership, never more than 200, began to decline as a consequence of the racial integration of nearby churches and migration from Madison County. The current Salem Baptist Church grounds consist of the church building, a cemetery established in 1903, various other outbuildings constructed in 2002, and a contemporary sign. The church and its surrounding grounds were added to the National Register of Historic Places on December 31, 2013. The current Pastor of Salem Baptist Church is the Rev. Bruce Willis. United States Department of the Interior, National Register of Historic Places, National Park Service, http://www.nps.gov/history/nr/listings/20140110.htm; Ruth Keenoy, Charlotte Johnson, Tom Raglin, and Renee Johnson, “National Register of Historic Places Registration Form: Salem Baptist Church,” http://www.nps.gov/history/nr/feature/places/pdfs/13001004.pdf.